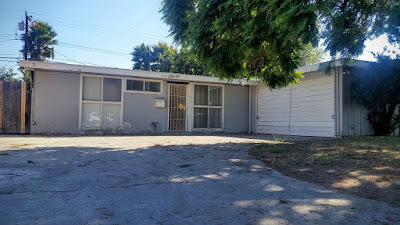 Built in 1955 in east Garden Grove, CA is this Palmer & Krisel-designed home ready for a new owner. A diamond in the rough, this home features three bedrooms and two bathrooms in 1,274 square feet, sits on a 7,200 square –foot lot and carries an asking price of $496,000. This north-facing home features a large, mature jacaranda tree as the centerpiece of the front yard. 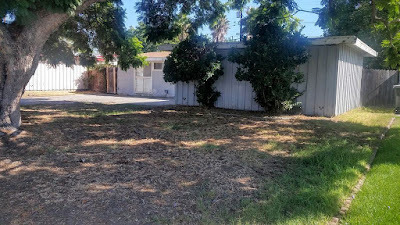 The tree sits over a patch front lawn, with a pair of scraggly shrubs planted at the base of the detached two-car garage. The garage maintains its original board and batten siding, while the main structure is covered in stucco and still features its original windows. 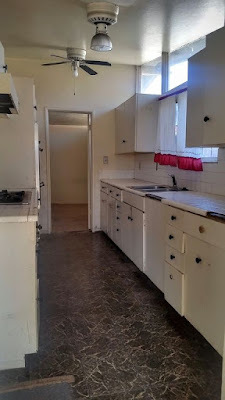 Inside, the home is actually a near-identical floorplan to yesterday’s featured 1953 Palmer & Krisel home in Winnetka, with the living and dining rooms at the rear of the home, all three bedrooms sited on the west side of the home, and the kitchen lying along the east side of the home. The entry is floored in vintage terrazzo tiles, while the front door has a pretty sweet square escutcheon surrounding the entry knob. 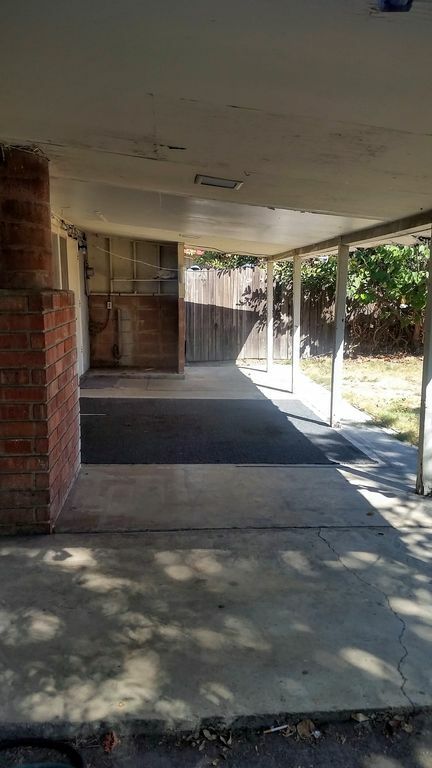 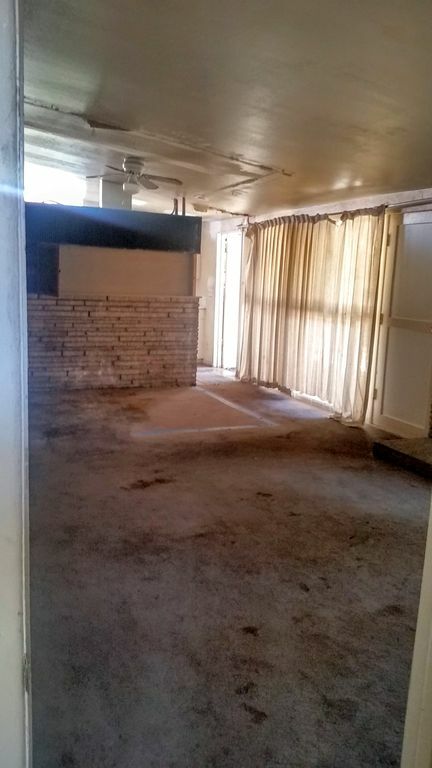 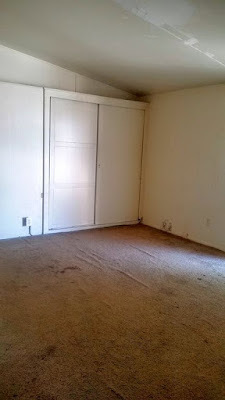 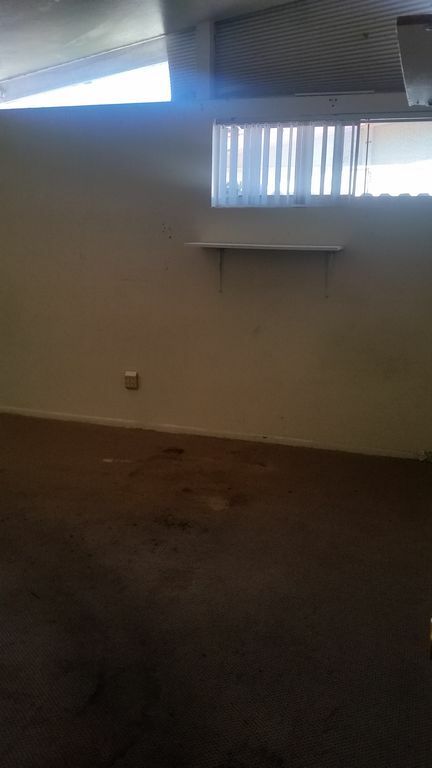 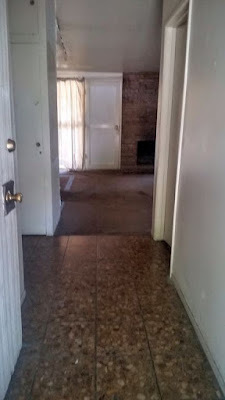 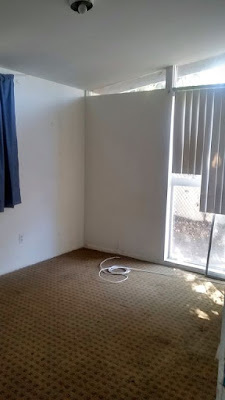 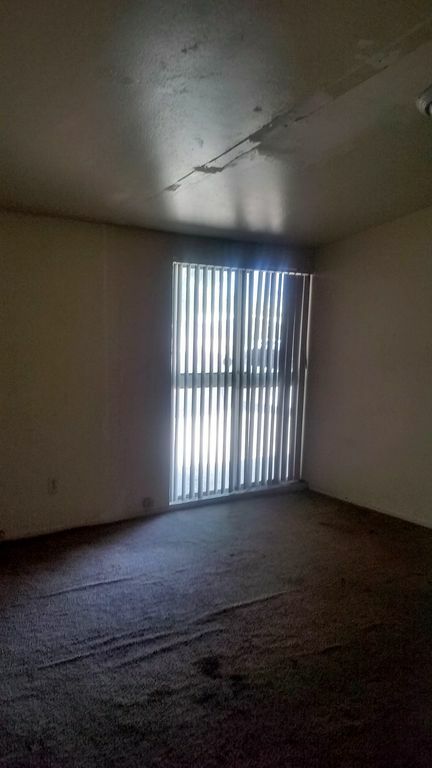 Pretty much all the carpeting in this home is a goner, but hopefully new buyers will see beyond that. 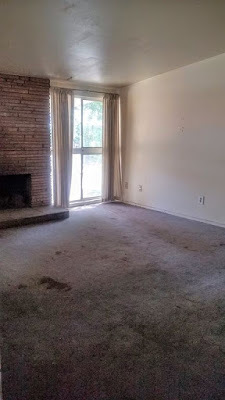 The living room is anchored by a stacked stone fireplace, which is surrounded by floor to ceiling windows overlooking the backyard. The original clerestory windows are still on the side of the home, allowing for natural light to flow freely into the dining room and kitchen. 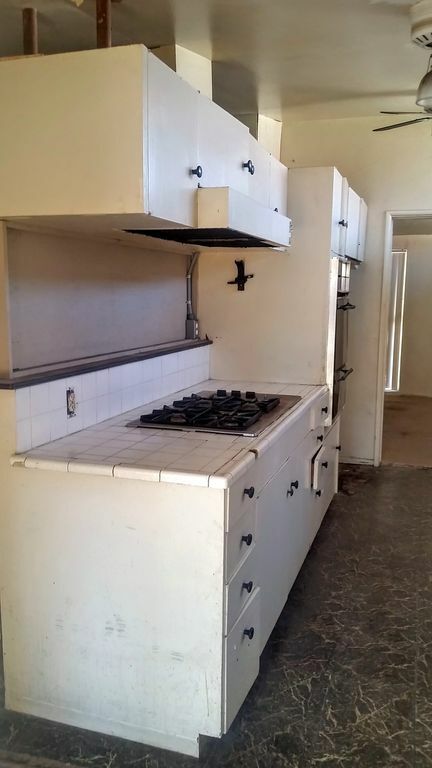 The kitchen is a near time-capsule, albeit a very worn one, with original cabinetry, pulls and a really neat square vent hood over the range. 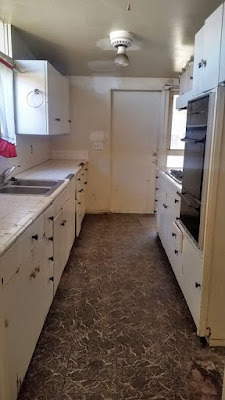 The appliances appear to have been updated over time, as have the tile countertops, which are crumbling away. 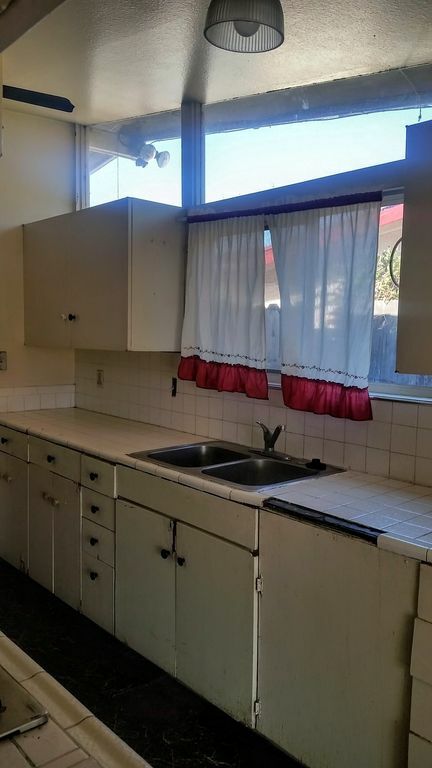 The three bedrooms are just as worn as the rest of the home, in need of some attention and TLC, but at least maintain their original window configurations and clerestory windows on the end bedrooms. 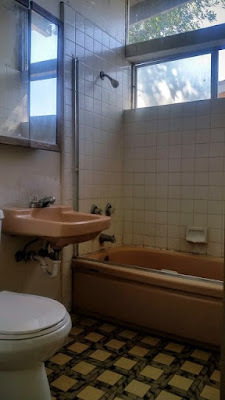 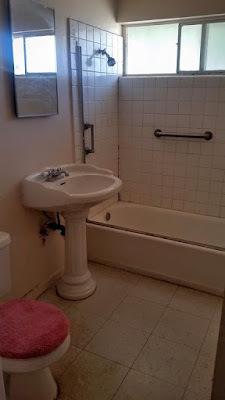 One of the bathrooms has been updated, but needs another go-around, while the bathroom on the west end of the home still has its vintage pink wall mounted sink and pink tub, which hopefully can be salvaged. 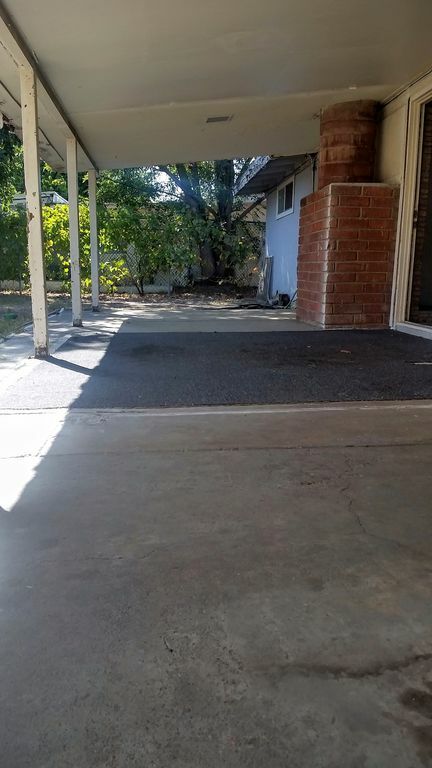 The south-facing backyard is just a blank slate as the front yard, and features a large covered patio along the rear of the home. The Garden Grove Palmer & Krisel homes interestingly featured rounded chimneys, a rare feature that was only seen in a handful of subdivisions, and this home’s rounded chimney can be seen poking through the covered patio. 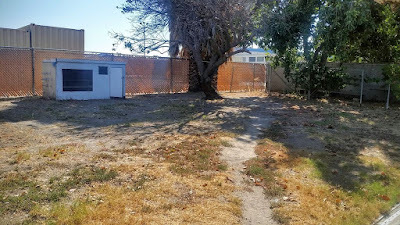 The yard backs up to the play fields and blacktop of adjacent Woodbury Elementary School, good for those who don’t like neighbors, bad for those who work from home. For those with a lot of vision who aren’t afraid of a little work, this home offers an excellent opportunity for those looking to take on a renovation.